I love USANA. However, if you know me or have ever heard me speak, you know my GREATEST passion is being a mom and a Grandma! So, in honor of Mother’s Day, we are giving you – our blog readers who reside in the U.S. – the opportunity to win a Sensé Deluxe Pack. I can think of no better way to pamper yourself, your mom, your wife, your girlfriend, etc. than indulging in this fabulous skin care system. 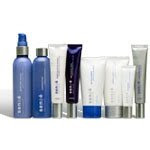 The Deluxe Pack retails for $179.94 and includes: Gentle Daily Cleanser, Hydrating Toner, Daytime Protective Emulsion, Night Renewal Crème, Eye Nourisher, Rice Bran Polisher, Nutritious Crème Masque, and Perfecting Essence. Sensé is a complete line of skin and personal care products without added chemical preservatives. It was developed by scientists and is recommended by dermatologists. The secret weapons include Topical Nutrition and Anti-aging Technologies. In an eight-week clinical study, Deluxe Pack users noticed a marked decrease in the appearance of fine lines, wrinkles and dryness, and increased smoothness, elasticity, and moisture. I have used the best skin care on the market and NOTHING compares to Sensé beautiful science. It truly is luxurious and I love pampering myself with this nutrition for my skin! Leave a comment on this post to earn one entry name slip in our drawing. To get additional name slips in our drawing, spread the word about this giveaway using your e-mail address list, linking our blog to yours, posting on facebook, twitter, etc. Each time you let us know you’ve helped spread the word, you’ll get an additional slip with your name on it in our drawing. Please leave your e-mail address so we can get in touch with you if you are our winner. This contest will run until Thursday May 7th. We will draw the winner on Thursday evening and announce the winner on our blog on Friday morning. I will priority ship the package to any U.S. address you choose in time for Mother’s Day. Good LUCK! Happy Mother's Day!I have helped spread the word to my team member by email.Thank you. Pleaae kindly include your Larsen Global team members and Larsen team members who are not in US in this contest by shipping the package to any global address participants choose in time for Mother’s Day. This could be done by ordering the Sense Deluxe Pack from the Usana office in the location where the winner wishes to have the prize shipped to.Happy Mother's Day! Collete, you are so encouraging! What a wonderful gesture! Have a wonderful Mother's Day! I started using Sense in February 2009 and it has been more than 8 weeks since and I swear that my skin has been better than ever. In fact, my usual one-pimple break out since becoming a mom myself, disappeared! Just like you, I have tried them all: drugstore brands, department store brands. But none of them compares to the results that Sense gives me. Thank you USANA! What a wonderful idea! Thanks for sharing the joy of being a mom with all of your USANA family. Commented and posted to my facebook profile! Thanks for sharing, your blog is great! Happy mother's day!! i posted this on facebook. Thanks for the opportunity to win. God Bless!! What a thoughtful idea for Mother's Day! Spread the word on Twitter here :http://twitter.com/MrsCox/status/1675188385Thank you! Collette!What a wonderful and generous offer! I can picture the lucky winner, having a chance to experience these wonderful products, maybe for the first time!! Count me in! I would love to try yrh products. Hey Collette…How are you? Shar commented on FB about your giveaway! What a fun way to celebrate moms:o) Hope you are doing well! Thanks for sharing your love and dedication and inspiration. Happy Mothers Day to you!! My mother introduced me to your blog, and I posted a link to your blog on my facebook page (http://www.facebook.com/profile.php?id=586449032&ref=name). Let's win this thing!! !You know I would jump on for anything Free!! !My Mother raves about these products. Hi!!! http://www.larsenglobalblog.com is one of the most outstanding resourceful websites of its kind. I enjoy reading it every day. All the best. I was very pleased to find this site. I needed to thank you for this good article Mother’s Day Giveaway â€” Larsen Global! I undoubtedly enjoyed every bit of it and I have you bookmarked to check out new articles you publish. Took my time to read all of the comments, however I really enjoyed the article Mother’s Day Giveaway â€” Larsen Global. It proved to be very helpful to me and I’m sure to all of the commenters here! I will subscribe to your feed, please keep on posting! Sources just like the one you talked about here can be very helpful to me! I’ll publish a hyperlink to this page http://joinlarsenglobal.com/2009/04/30/mothers-day-giveaway on my blog. I am certain my guests will discover that very useful. Thanks for sharing! Resources just like the one you talked about right here will be very helpful to me! I’ll publish a hyperlink to this web page http://joinlarsenglobal.com/2009/04/30/mothers-day-giveaway on my blog. I am positive my visitors will discover that very valuable. Thanks for sharing!